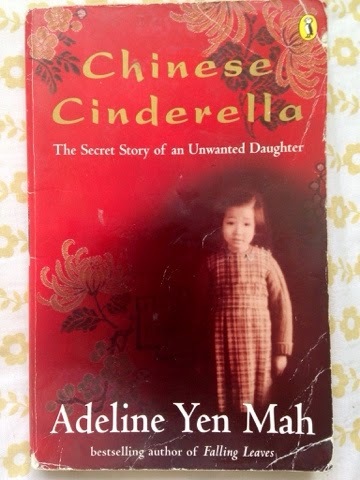 Chinese Cinderella is an autobiographical telling of Adeline's childhood. As the fifth child of seven but the last of her mothers children she was born to a family who don't want her. She was never able to know her mother due to her untimely death following Adeline's birth. She was hated by her brothers and sisters who look upon her as the reason their mother died. Her father remarried and had two further children who became prized members of the family, pushing Adeline further down the ladder. All Adeline had was her Aunt Baba, her grandparents and her mind. A bright and thoughtful child, she found solace at school and in her home work. This was a tale of an unwanted child and her strength to overcome the obstacles put before her by a family who resented her. This is a beautifully written story aimed at children but read by adults alike. Heartbreaking and full of pain and anguish it tugs on the heart strings throughout. I read this for the first time as a child, I took it as a story, almost as the title suggests- a fairy tale. As an adult I found the read much more difficult, the book is autobiographical and the events were at points distressing to read. I have read in some reviews that readers found it to be whiny and self indulgent but I disagree. The allegations of child abuse, both emotional and physical, may have been the focus of the book but I wouldn't say the author was whining about them. I found the book to be an outlet for her to release the torment of her childhood. Some readers may struggle to sympathise with Adeline as at parts it is hard to look past the privilidged life she lived, a nice house, a good school, food on the table. But without a doubt she was abused, hated by her stepmother and the rest of her family for a variety of reasons. Look past her good education and see a little girl who wanted nothing more than to be loved but was denied it. There was something very precious and vulnerable about Adeline's relationship with her Aunt Baba. For me the best part of the book was Adeline's loyalty to her aunt and her aunts undeniable pride and love for her niece. I implore you to read it, it is without question one of my all time favourite reads and I almost want to pick it up and start all over again.